The Horse Fund’s staff and volunteers work year round on behalf of horses, donating their many talents and putting in impressive hours despite having the pressures and responsibilities that go with daily life. Twice a year we give them much deserved time off — during the summer and at Christmas time. Everyone will be back in full force July 10th. We are so grateful to these heroes. Stay in touch with us here at Tuesday’s Horse. Our summertime recommended reading list for 2017 will debut next week. HOUSTON, TEXAS — All of our staff and volunteers are finally back. Thank goodness. Whew. We are still putting together year end reports from 2016 and it’s all folks on board. Wow, were we busy. So much went on. Lots to collate, evaluate and sort through. We want to give you what you need without overwhelming you. So hang in there. We are just about there. I know what I’ll be doing this weekend. Again. In the meantime will you please read the following. It is one of the most important articles we posted in 2016. You will be a better advocate for it. Bless you everyone and thank you. We have been so busy this year working on horse cruelty issues, lobbying, taking part in rescues and intervening in the Courts on behalf of horses confiscated in cruelty cases we have not given our website the full attention it deserves. That has been rectified and it is looking it’s old terrific self again. Another issue with our website is that it had grown so large with so much information we needed to build another site to act as an archive. Once this is complete we will be able to streamline our main site even further which will make it easier to navigate. Fortunately our social media sites have represented us well while all this was going on. There have also been significant upgrades where we host our online Gift Shop and we are beginning to take advantage of the new options they are offering. One of these new options allows us to showcase our designs in Collections and plus product created by fellow designers. Here is a Collection we made from one such designer. We call it Silhouette Horses. The artwork is beautiful. 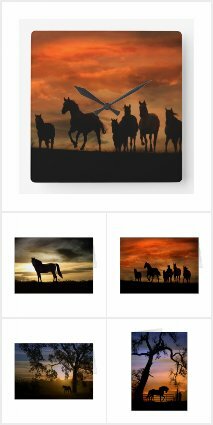 Here is a Collection which has horse related holiday cards and postage. And a close up of a design from that Collection. Lady in white and white horse holiday greeting card front by Rainbow Fairy. And look at these darling cartoon ponies. These Collections say “by Vivian Grant Farrell” but that means ONLY that I put the Collections together not create all the artwork (as if!). All proceeds from sales benefit the horses. We appreciate your hanging in there with us. It has been a wild year and 2017 looks like it will be more of the same. Much more. Thanks again. The Horse Fund’s signature horse. With gracious permission all these years by international photographer Bob Langrish. Thank you. Oh, I also updated the Horse Fund’s logo to more closely resemble Mr. Langrish’s image. It will be available on merchandise soon as will our Tuesday’s Horse logo. Finally.